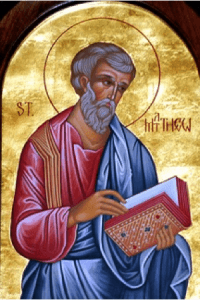 St. Matthew was originally a tax collector during the time of the Roman Empire. Jewish tax collectors were considered destructive betrayers of their country and religion by their peers. Speaking with a tax collector was considered a sin, and associating with one was defilement.When Matthew first heard the voice of Jesus Christ, he left everything and followed the Savior. The Pharisees asked why Jesus ate with sinners and tax collectors. But the Lord had “come to call not the righteous, but sinners to repentance” (Mt. 9:13). Matthew acknowledged his sins, repaid anyone he had cheated, and gave his remaining possessions to the poor. He wrote the first gospel as one of the Four Evangelists, and is often depicted holding a large book. For more information on St. Matthew, please visit the Orthodox Christian Network‘s website.